By-Law enforcement is accomplished utilizing the services of specialized professionals which have jurisdiction and authority to administer the by-laws of the Town in the areas of canine/animal control, general by-law enforcement services and parking enforcement. 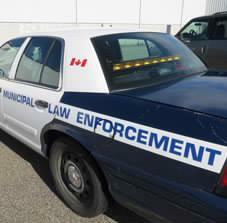 Municipal Law Enforcement Services (MLES) has been contracted by the Town of Renfrew to provide by-law services and enforcement for the municipality in accordance with the priorities and policies established by Council. MLES investigates complaints, conducts investigations, submits investigation reports and takes appropriate action to prevent a continuation of offence(s) and to resolve matters in a timely and effective manner. All By-Law Enforcement Officers enforce all specified by-laws based on complaints and will proactively enforce the Parking By-Law effectively throughout the entire Town of Renfrew. Officers conduct mobile patrols throughout the Town, including municipal facilities, parks, playgrounds, arena and sports fields. Foot patrols are made of the downtown core and other areas. By-laws have been adopted to provide the framework in which enforcement activities are undertaken. The By-Laws attempt to balance the needs of enforcement with the priorities of the Town of Renfrew while recognizing the need for confidentiality and due process. The Town of Renfrew encourages everyone to be good neighbours and communicate with each other to resolve problems without the need for official intervention by enforcement officers. Occasions do arise, however, where it is appropriate to approach By-Law Enforcement for assistance. Remember, it is important for the complainant to identify him or herself, so that an officer can obtain additional information regarding possible by-law violations and so that the officer can advise the complainant of the results of the investigation. While the Town cannot guarantee that the ideal solution will be attained for every problem; enforcement will be undertaken to the extent possible or required by law. 29-2012 - Consolidated Parking By-Law Consolidated Parking By-Law..
To licence, regulate and govern the sale or hire of goods or services on an intermittent or one-time basis, and the activities of a Trasient Trader. To prohibit and regulate certain noises within the Town of Renfrew.